Shimmerz Paints: Shimmerz Blog Hop! Welcome, welcome, to the Shimmerz Paints "We're Thankful" Blog Hop! The holidays are quickly approaching, and we will soon be entering into the gift giving season. Before black friday appears though, we want to remember all the things that we are thankful for this year. We've decided to put on a blog hop, telling you things that we are thankful for and along the way we will share with you our own personal favorite Shimmerz Products, and give you the opportunity to win some fabulous prizes! Have you seen our new collection? 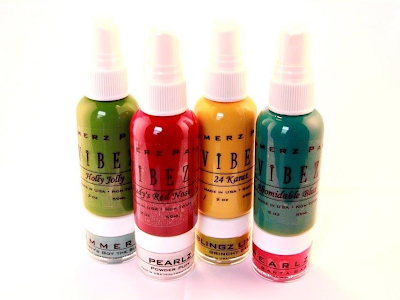 It's made up of of 4 new vibez colors, shimmering with golden luster! They will work amazingly with our holiday collection that we are re-releasing for the holidays! If you didn't get the opportunity to snag these last year, now is your chance! Here are a few of the holiday projects that were created by our team last year, that used our previous holiday collection, and that we loved! 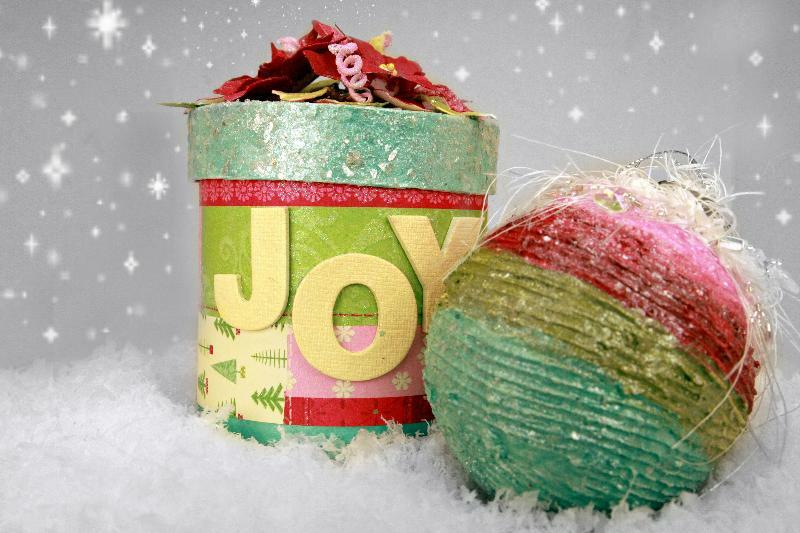 This adorable box, and ornament were created by owner, Stacey, and we think they are just sooo cute! 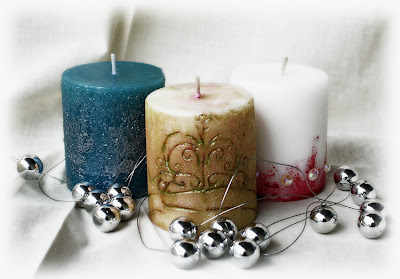 These candles were altered by me, Heidi Kelley. I just love how they shimmer on my holiday table, adding sparkle and pizazz as a centerpiece. And this layout, created by Stacey Young, well...everytime that I look at it, I swoon. One thing that we know for certain, though, here at Shimmerz, is that one of our favorite things about this past year, is being able to inspire all of you, and we hope that this blog hop has done just that! We appreciate all of you, are crafty friends, and wish you the most amazing holiday season! What's up for grabs if you play along? THE WHOLE MERRY & BRIGHT COLLECTION!!! Alrighty, here are the rest of the blog hop links, in case you get lost somewhere around the way. You have until November 25 to enter, and we will notify all the winners sometime shortly after!! Thanks for playing along with us!! Have fun, and be inspired! From all of us here at Shimmerz! Thank you!!! I'm just starting the journey but the first project here are beautiful!! I just finish to see all the beautiful creations of the team. I would love to try the enamelz and the blingz!! It didn't take long to do the bloghop. Seriously talented people. I'm very thankful for my family. I don't know what I'd do without them. As for a Shimmerz product? That's a hard decision, but anything that sprays glimmer has to be good, no matter what the color! Such beautiful projects! So happy I stumbled upon Shimmerz products! The DT creates such inspiring works and makes me want it all! Can't wait to receive my first order! Thanks for the inspiration! Love the projects shown here. I'm starting the hop. Great Blog Hop! I saw a post by Jamie and thought I'd play along! I'm thankful for my family and friends (that are like family!). And I would love some Vibes! Finished the hop, and there were some AMAZING projects shown. I'm thankful for God's Grace, a support husband, my family and good health. I would love to have the Merry and Bright collection, and all your embossing powders. What a fab hop! Thank you for all the time and effort you all put in to bring us this hop! I'm grateful for Zumba and my Zumba instructors! I totally love it and it is inspiring me to get off my buns and move!!! Gonna need it after Turkey day!! What a great hop! I could never choose one product, but my favorite of your products is the Coloringz. Love how vibrant the colors are. I am most thankful for my family. We were almost torn apart and I am so happy my son survived! I am thankful for my husband! I would love to have more colorz of any of the Shimmerz products! I knew when I started this blog hop I would be inspired. I come to your blog all the time and watch all of your videos! Well let me tell you, the DT outdid themselves! amazing works of art! I have so many ideas that I want to try and I've made a list of their favorite Shimmerz products so I can buy them on your Black Friday Sale! ho ho ho...santa is coming to see me! I'm most thankful for my family..there are always things you want/need...but without a family those things would be half as nice! To me, Family is everything..i never let my children or husband leave without telling them I love them, same thing with the phone, the last thing I say to them before I hang up is those 3 simple words I Love you...those little words have more meaning than any I know of. Gorgeous projects and I love those new colors! Love these Creations... I would have to agree SWOON on Stacey's GORGEOUS layout!!!! I NEED some Coloringz! I have a few Vibez, but they do not pack that punch! I have been to all of the Blogs and I have to say each and everyone was very inspiring. i had so much fun seeing all of the different products. Amazing team you have. I would LOVE LOVE LOVE (did I mention LOVE? )to own any of the Shimmerz paints. Thank you for the chance to see some amazing work and a chance to win. I just finished the hop and am left inspired! I'm thankful for a supportive family and uplifting friends, and two of the sweetest kids ever born! I hop hop hopped along & seen AMAZING Projects.... I AM THANKFUL & feel blessed for my family every single day!! I will have to admit I only have a couple of Spritz bottles.... BUT! after watching a Video @ Jamie's blog!! I think will be grabbing some of those Shimmerz paints & more spirtz!! wow...amazing, amazing talented group of women!!! I wanna play now. I am thankful that God blessed me with my husband and three kiddos. They have given me purpose in life and for that....I am forever grateful. Oh my... so many beautiful, gorgeous and colorful projects along the hop. Thank you!!!! (hanging my head in shame) I have to say that I own 3 bottles of shimmerz paints, thats it! I truly love them. I would love to get my hands on some of your gorgeous sprays and blingz and enamel... sigh. I'm thankful, of course, for my family and all that, but I am also thankful for the fun creative world. It gives me strenght on bad days, it gives me joy, discovering new idea's and it gives me love, from everyone around the world!! I am thankful to be alive! I have some serious health issues and although I am very sick right now, I still woke up this morning and that is the biggest blessing of the day! To still be here and watch as my children fall in love and start families of their own!! I'd like to try the Spritz and the Coloringz... I think they will go well with my DT projects for Magenta and Katzelkraft anyway! Can I buy your product here in the Netherlands? Thanks for the HOP! I am inspirated, for sure! Love Shimmerz and looking forward to Black Friday sale. Dying to try the enamels and blingz... I am thankful fr my loving supportive family! Everything is bearable because of them. What an amazing bloghop. The creations were all so gorgeous and inspiring. VERY talented women. 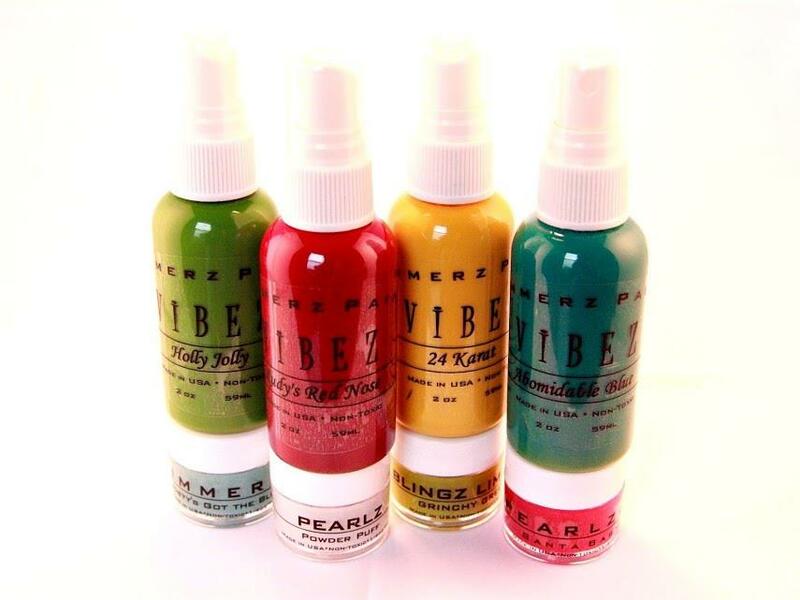 Love the vibrancy of all the colours and products but would love to try some Pearlz. I am excited to see what the rest of the team has, the projects here are Fabulous!! gorgeous projects!!!!!! Loving these colors! I am thankful I did this hop. so much inspiration was shared. And I'm off! Can't wait to see the art! These are great projects and inspiration! AWESOME HOP.....UBER talented designers....TONS of inspiration!! Thank you!!! So much amazing inspiration!! I am thankful that you have such a talented team to share this inspiration with us all! Have a wonderful and blessed Thanksgiving!! Beautiful projects from the team!! Thanks for the inspiration! looking forward to seeing all the yummy inspiration on the bloghop! Great inspiration...! I am heading to a new horizon in my scrapbooking. These look like wonderful products! I think I love the sprays the best--so much I would love to try with them! This year, I am thankful for my family, my pets, our jobs, and the weather here in Florida. Thanks for an awesome blog hop and the op to win! so much talent on the hop. thanks for all the inspiration and the chance to win. This year you have done some amazing projects! I love the candlew and I have to try them myself. Well since here we do not have a Thanksgiving day or a Black Friday, I have to say that I am grateful for the online Black Friday deals! I want to go shopping!!!!!!! Just finished hopping!!! WOW WOW WOW... What an AWESOME DT you have Stacey :)) You would be so proud.. So I am thankful for all the inspiration, tips and hints from your DT with the Shimmerz!! Ok I love your projects and I have ended up here again as instructed! Love the sprays but love all your products! I am so thankful for all the wonderful friendships I have made thru this hobby!thanks for a chance to win these awesome colors! Thanks for this so inspiring blog hop, I am grateful for my new wonderful life in Australia and my husband and children, they are my inspiration they bring joy every day! I would love the brand new set of colours they look scrumptious!!!! I love all colors and don't know what to begin with!!! Wonderful projects!!! Great blog hop!! I am thankful for being healthy, for my family, my parents and what they did for me and for every moment in life! Just live your life!!! It is a gift! Hello! I am off to start the blog hop and get inspired by your awesome DT!!! I just finished the blog hop! It was a great and very inspirational ride! I would love to win any of your products as I can't find them in Greece!! I thank God for having my family and me healthy! It is the most important thing!!! I really enjoy seeing the DTs work of arts using Shimmerz. Thanks for the hop. This year I'm so thankful for my parents who always be there for me no matter what happened. I LOVE Shimmerz...but dont have any yet. :( Hopefully soon. Thank you for the hop and the opportunity to see all your designers at work. I love what I saw. I don't have any Shimmerz, so anything would be wonderful. I would love to have some playtime with your gorgeous products. Just starting the hop but I'm excited about what I may find! Loving the gorgeous, bright and vibrant new colours so eager to see how these talented ladies put them to use and what creative projects they come up with. Thank you so much for sharing all of this and for the opportunity to win some of your products. I have been an admirer for quite some time, but yet to be a user. I have not found shirrmerz in local stores so it is time to place an order. I love the projects I have seen and would love to try the product. I left a comment before I started to hop, but I had to leave another after finishing the hop. I am so thankful that I took the time to follow through on this one. There was so much inspiration. I also saw the many uses of Shimmerz products and the beautiful depth it creates when used. In the spirit of being thankful I am so thankful for my family and friends. They mean so much to me. I am also thankful for my dogs, even the puppy who refuses to be house broken. I could go on, but this is a comment not my blog post. Unbelievable projects here. I am going to have to tackle them sometime soon....because I am deffinately looking to different and beautiful! Being thankful many family and friends that has helped me through this past 15mos while I have been disabled. Socially, mentally they have helped keep me together! Without them and of course some creativity (scrapping and crocheting) I would not have made it thus far! I am also thankful for the many types of technology today. Without it, I may never be able to walk again, and/or be pain out of most of this pain. What a fabulous hop. So much gorgeous beauty and colour, you make it hard to pick a favourite product. As far as I can see all your products shine with shimmery brilliance. Thanks so much for the wonderful inspiration. Love how modern technology can bring us all together from all parts to share the creativity. For me, each moment of every day is a blessing and I am truly thankful and for what I have.